Before the service, the music groups lead the church in worship songs to focus our minds on God. Children and young people worship with us for the first part of the service, which is family based, then leave for Young Church, with differentiated activities for the 0 – 11 year olds. A creche is also available for younger children. The style of worship at the morning service is a mixture of modern and traditional songs and hymns, accompanied by a music group as well as our church pipe organ. The climax of the service is the preaching of the Word or Sermon, which is given by various preachers, either a visiting or from our own congregation. The preaching of God’s Word is central to all the services. On the first Sunday of the month we celebrate Communion during the morning service. After the morning service there are refreshments in the downstairs hall, for fellowship and to meet any new people and visitors. led by Pastor Guy Kakesa. You will be assured of a warm welcome and a lively service, with Congolese drums and keyboard, in the church hall – entrance through side door in the garden. The evening service is more meditative than the morning service. There is a mixture of modern and traditional hymns, either accompanied by the keyboard or organ. Again, the sermon is given by a visiting preacher or one from our congregation. 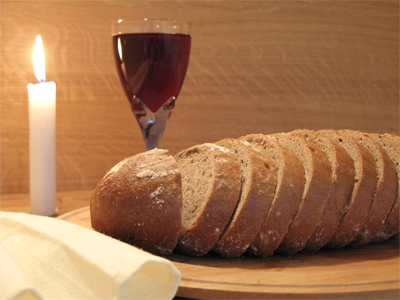 On the third Sunday of the month we celebrate Communion during the evening service. On the first Sunday morning and the third Sunday evening service every month, we share Communion during the service, when we remember the death and resurrection of our Lord and Saviour Jesus Christ. All Christian believers are invited to join with us in Communion, church membership is not required. The bread is passed around first by a deacon and eaten when received. Then the wine (unfermented) is served in small individual cups and taken together. If anyone does not wish to take the bread or wine it will be passed on to the next person. We welcome anyone to observe this celebration of Jesus’ death without feeling they have to take the bread and wine.